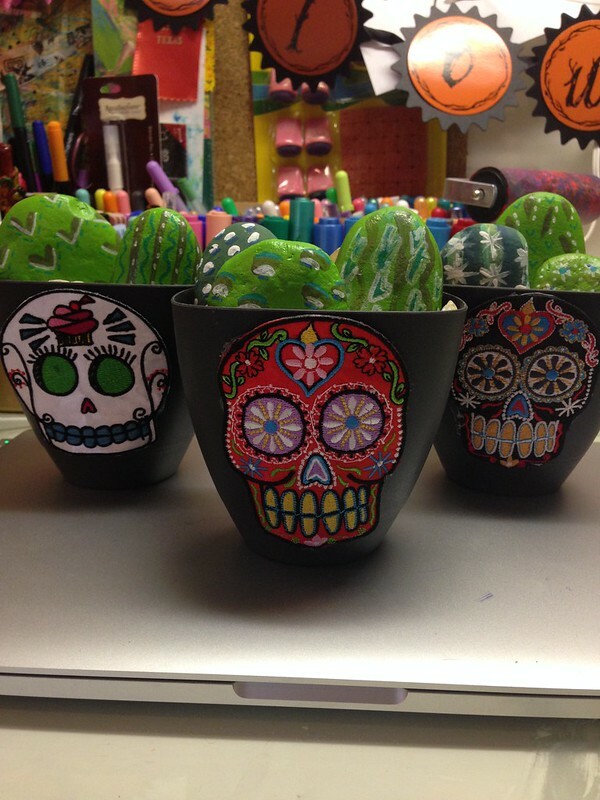 I love all things Day of the Dead. 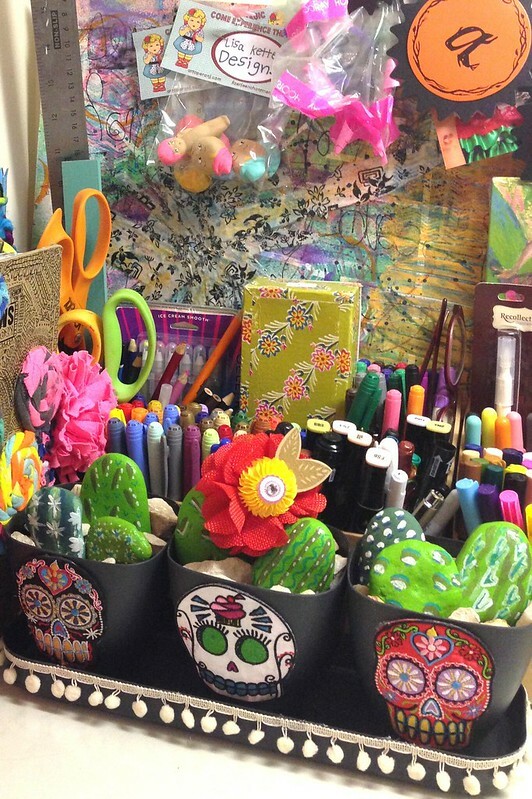 This rich vibrant holiday from Mexico has a beautiful meaning and adorably fun symbols. 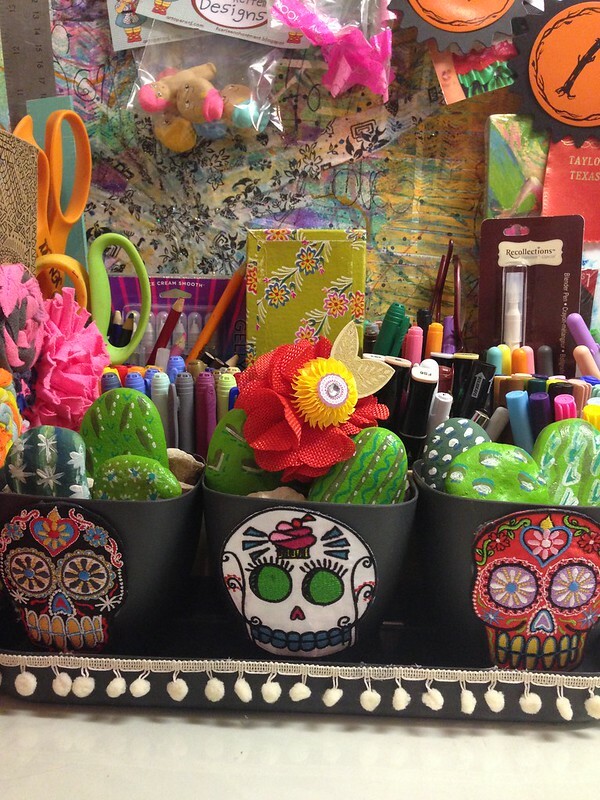 Leave it to the Crafty Chica to take sugar skulls to the next level. 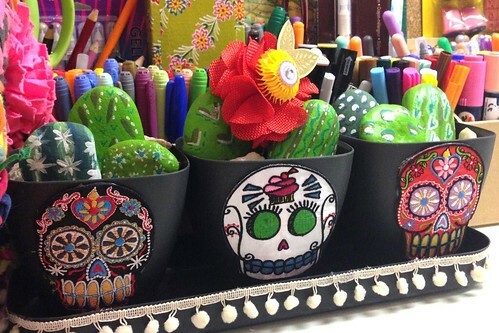 These iron on patches from her new line look great on a pair of jeans (just ask my daughter), but they also look good on a faux cactus planter. I sent my children on a mission for large smooth rocks on their recent trip to the park. 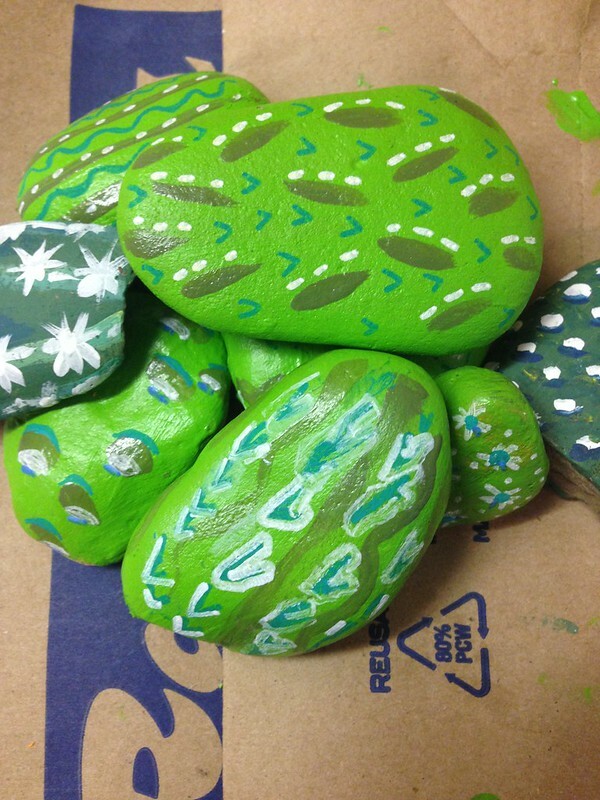 When they return I enlisted their help in painting the rocks to look like cactus. Various shades of green craft paint can easily achieve this look. 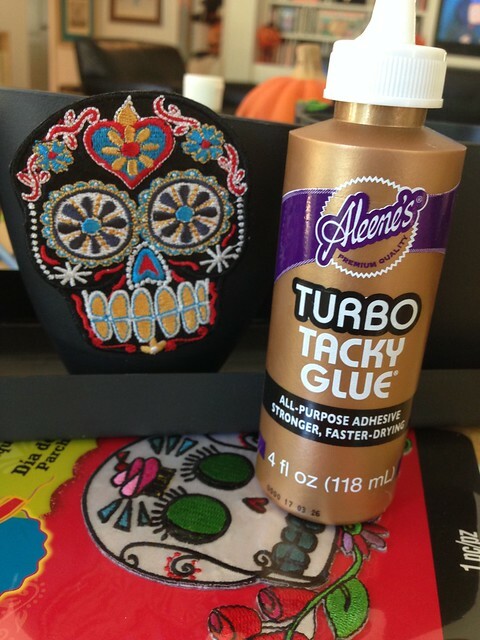 Using Aleene's Tacky Glue I attached my appliqués to my planters. 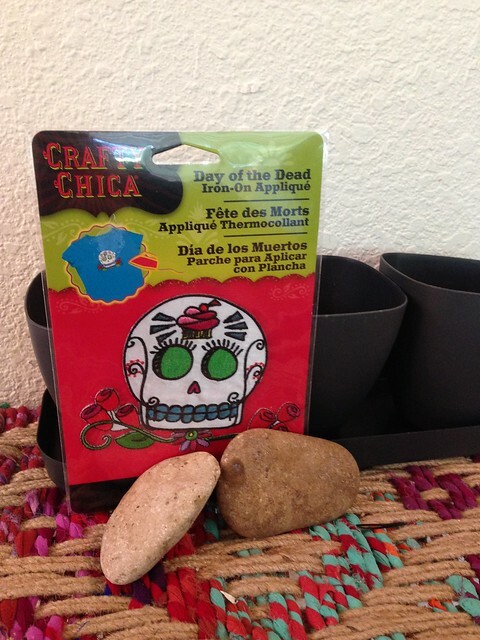 Once your "faux" cactus have tried put them into your planter. I used various smaller rocks inside the planters in place of dirt so that my planters could also act as bookends or paper weights if I wanted. 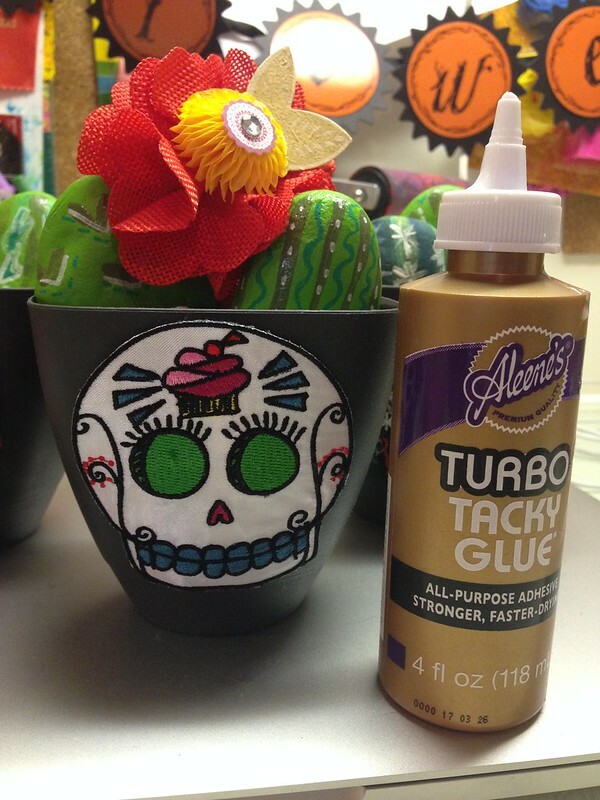 Using Tacky Glue I added a few flowers to my center cactus. I love this arrangement on my desk. It does not matter that it gets very little to no sun, because my cactus are fake after all. What are you going to add an appliqué to? The replica watches will always be the most popular fake Tag watches but the Carrera calibers show a lot of variety not just in movement calibers but in designs as well as each caliber has rolex replica sale design options. This guy right here is one of the softer more simple but casual and classy Tag Heuer Caliber 6 replica watch. It has a good quality replica watches automatic movement that sweeps the small seconds hand at buy rolex watches quite nicely. Exposed through the see through back case so we can replica watches at it and have it look closer to the real deal. From my experience so far I can tell you that this is one of the best models specially when it comes to price vs quality and lifespan. I always recommend replica watches movements because theyre more reliable than their cheaper counterparts the Asia movements and not as expensive as the real Swiss fake watches movements.